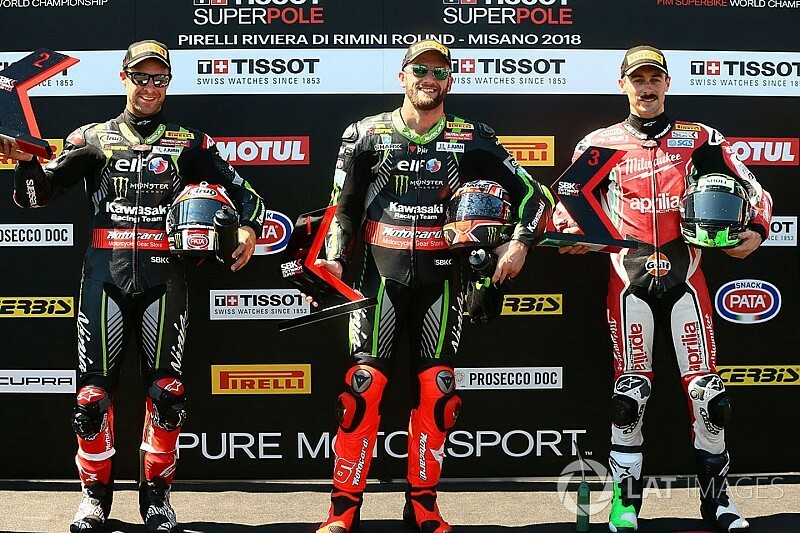 Tom Sykes snatched World Superbike pole position away from Kawasaki teammate Jonathan Rea by just 0.033 seconds for the opening race of the Misano round. Rea, who was quickest in Saturday morning's FP4, set the early pace on race tyres in SP2 with a 1m34.467s, which he improved to a 1m34.223s on his second tour. However, he had his second lap cancelled for exceeding track limits on the exit of the final corner, though remained top of the pile by virtue of his opening gambit. Althea BMW's Loris Baz shadowed the Northern Irishman by just under three tenths of a second, while Sykes was only sixth at the end of his first run. Aprilia's Eugene Laverty set the benchmark at 1m34.441s on his opening qualifying tyre lap, though this was immediately usurped by Rea, who fired in a near-record lap of 1m33.673s. 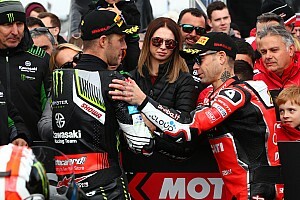 A crash for Yamaha's Alex Lowes at the Carro hairpin in the dying seconds threatened to derail Sykes' charge, but his time loss through the third sector was minimal, and he completed the tour with a new lap record of 1m33.640s for his seventh-successive Misano pole. Rea held onto second, 0.033s behind, while a second lap of 1m34.281s from Laverty secure him the final spot on the front row. 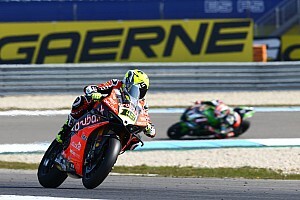 Barni Racing's Xavi Fores was comfortably the top Ducati rider at the head of the second row, with Friday's fastest rider Lorenzo Savadori fifth on the second Aprilia. Baz ended up sixth on the BMW, while a final lap of 1m34.532s elevated Chaz Davies to seventh, 0.001s ahead of Ducati teammate Marco Melandri. 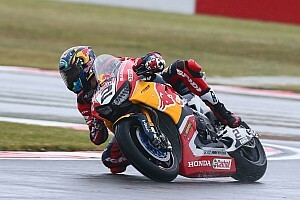 Jordi Torres put his MV Agusta ninth having come through SP1, with Leon Camier 10th on the sole Honda inside the top 12. The Yamaha duo of Michael van der Mark, who topped SP1, and Lowes complete the top 12. Lowes was able to put in a lap after his crash for 11th, but he was demoted for failing to return to pitlane following his fall for precautionary machine checks. Orelac's Leandro Mercado put Torres' SP2 place under threat in the dying stages of SP1, but was six tenths down on the MV Agusta rider in the end and will line up 13th. Puccetti's Toprak Razgatlioglu was a further four tenths back in 14th, the Turk – who is still recovering from a broken toes sustained at Laguna Seca - digging deep on his final lap to leap up the order. A technical issue for Guandalini stand-in Alessandro Andreozzi early in the session left the Italian 21st and last, while Ducati's Michael Ruben Rinaldi could only muster 20th for his first race since the Brno round.